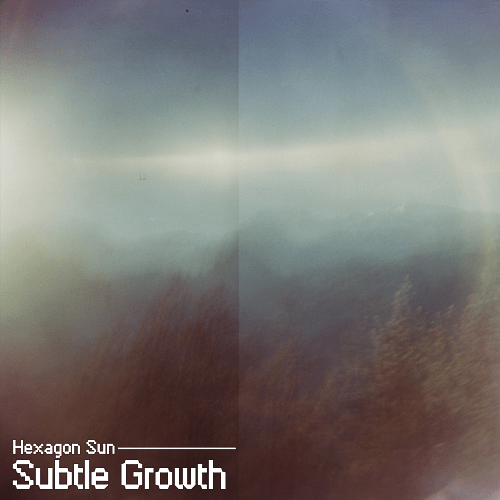 Hexagon Sun starts this release by planting a strange melodic seed called ‘The Piece of Reality / Remember. It has an emotional dramatic touch to it and the oddness of playing with the edges of going out of tune, which creates a beautiful but fragile emotion of sound. The seed opens up and a little plant comes crawling up out of it. It goes up in the same fashion as the previous work but leans towards the sky to fulfill its final growth. ‘Wherever The Rays Take Us’ is an eccentric ambient work that fits perfectly with the next phase of this release. ‘Polysignal Awareness’ is another beauty that follows more the straightforwardness of calming and soothing minimal ambient music. The melodies are sweet and comfortable, something that would be a great track for dream adventures. The authentic strangeness prevails with the beautiful sounding ‘Abstained, With The Nautilus’ track. The tones used in this piece are almost of an alienating order, but do real justice to the calm and pretty flow of emotional chill-out music. ‘There, In The Oceans Beyond Time.’ Is another little wonder that has been captured here on the ‘Subtle Growth’ release. Delivering almost a church state of mind with beautiful layers of synthetic pads to wrap your head with full delight in. The last track keeps up with the pretty strangeness this release has been surrounded with. It is called “Millenia As A Sunset’ and zooms like a beautiful bee the story to an nice ending. This entry was posted in ambient, electronic, experimental and tagged ambient, chillout, electronic. Bookmark the permalink.